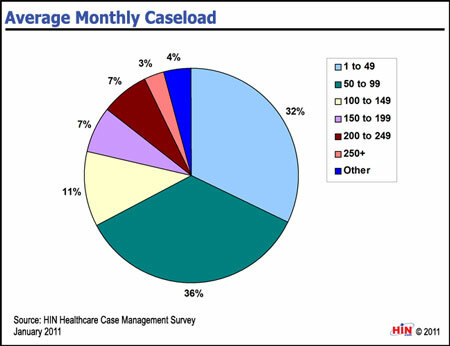 Healthcare Intelligence Network- Chart of the Week: What is the Average Monthly Caseload for Case Managers? New Chart: What is the Average Monthly Caseload for Case Managers? SUMMARY: The job description of today's case manager is likely to include home visits, crisis management, quality improvement and health coaching — and may increasingly require co-location at the site of care. We wanted to see what the average monthly caseload was for case managers. Download the executive summary of 2011 Benchmarks in Healthcare Case Management: Responsibilities, Results & ROI. 2011 Benchmarks in Healthcare Case Management: Responsibilities, Results & ROI is a 40-page special report that provides actionable information from 201 healthcare organizations on the prominence, placement and responsibilities of case managers as well as program-driven results in healthcare utilization, cost and compliance. This second annual analysis of healthcare case management trends is packed with metrics and measures on current and planned case management initiatives, presented in more than 40 easy-to-follow graphs and tables. 2011 Benchmarks in Healthcare Case Management: Responsibilities, Results & ROI is available from the Healthcare Intelligence Network for $139 by visiting our Online Bookstore or by calling toll-free (888) 446-3530.